These ready-to-run pump tanks are built from heavy-gauge steel and strengthened with perimeter reinforcement. Mild-steel models receive epoxy coating inside. Custom options are available to meet your specific application requirements. Offered for tower water systems to 1000 tons, and chilled water systems to 600 tons. All types of industrial applications can benefit from using these pump tank stations for plant wide water distribution, including most Plastic molding processes, Diecasting, Dry Cleaning, Food Service and others. 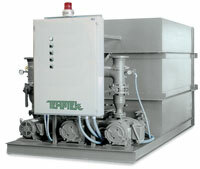 Temptek offers systems in capacities from 275 to 3000 gallon capacities. (2 pumps) Depth : 112"
1. Since product innovation and improvement is our constant goal, all features and specifications are subject to change with notice or liability. Selection of certain optional features may change listed specifications. 3. Displayed weight data does not include the weight of pumps or controls. Image shown is typical. Actual unit appearance will vary according to specifications.